InLoox now! - the InLoox project platform in the Cloud - now offers new features that make team communication and time planning in projects even easier and faster. Now, every team member can receive a convenient e-mail reminder from InLoox now! when an activity for which they are responsible is coming up. The administrator can specify how many days in advance resources want to receive the e-mail. So, all processes are coordinated perfectly and you are able to start your work in the project at exactly the right time. This reduces the communication effort in the team and all team members are always up-to-date. Now, the project planner can adjust the duration of a planning element directly in the line without having to open it first. 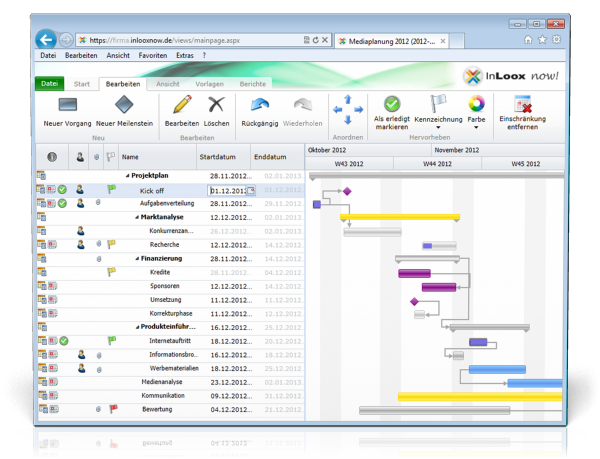 Besides that, every user can see in the planning view at a glance if a planning element contains time constraints or not. The start and end date of planning elements without time constraints are now displayed in grey. As soon as there are certain restrictions such as "Start no later than", "Start no earlier than", "Finish on" or "Finish no later than", the respective date is displayed in black in the planning. Speed up your project work with InLoox now! For the update, performance has been significantly improved. This accelerates working with InLoox now! and you can benefit even more from the new features - e.g. on the go or at places with low Internet speed. The update is available for all InLoox now! subscribers without any additional charges. Take the opportunity and test InLoox now! for 30 days, free of charge and with no obligation. The test will end automatically. InLoox now! with New Features - InLoox • Copyright 1999-2019 © InLoox, Inc. All rights reserved.